If you wonder what significance 2012 has now, it is nothing but the title of the Hollywood flick that will be released on November 13, 2009. 2012 is a science fiction in which the ancient astrologers predict the end of the planet earth in that year. The film, which is directed by Roland Emmerich, will have special effects to the maximum, as there are volcanoes, tsunamis, storms and earthquakes due to which the earth is destined to meet its end. Roland Emmerich has co-written the story with Harald Kloser. 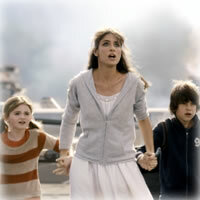 The film stars John Cusack, Amanda Peet, Danny Glover and others. The director has film like Independence Day and The Day After Tomorrow to his credit. This science fiction is made on a budget of $200 million.